- The ruling party KULMIYE has set 15/04/2012 as the date which the party convention and all central committee delegates’ country wide are expected to attend at the party’s headquarters in Hargeisa. Speaking to the press the Chairman of KULMIYE Hon Muse Bihi Abdi the Chairman of Central Committee Jama Ismael Egge (Shabeel) Secretary General of the party Hassan Saeed Yusuf among many others, today’s press conference was held at the party headquarters. 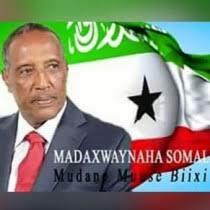 The Chairman Hon Muse Bihi Abdi said that we had called this to announce the date of the party central committee convention which is to be held on the 15/04/2012 so we are expecting all regional to converge at the party headquarter no later than 10/04/2012, so as to solve all outstanding issues prelude to the convention date. The secretary general of KULMIYE Hon Hassan Saeed Yusuf elaborated on the need to fulfill the rules set for the existing parties and the newly registered parties, with this development we (KULMIYE) are expected to be fully prepared as a party prelude to the upcoming local Government Elections. KULMIYE was founded back in 2002 since then it proved to be the only opposition party to present a challenge to the then ruling party UDUB.